"It's Always Something...": Japan: In Search of "The White-Faced Geisha"
Japan: In Search of "The White-Faced Geisha"
Choose the appropriate time of day for spotting. Familiarize themselves with the target's plumage. Positioning ourselves in the Gion district of Kyoto. 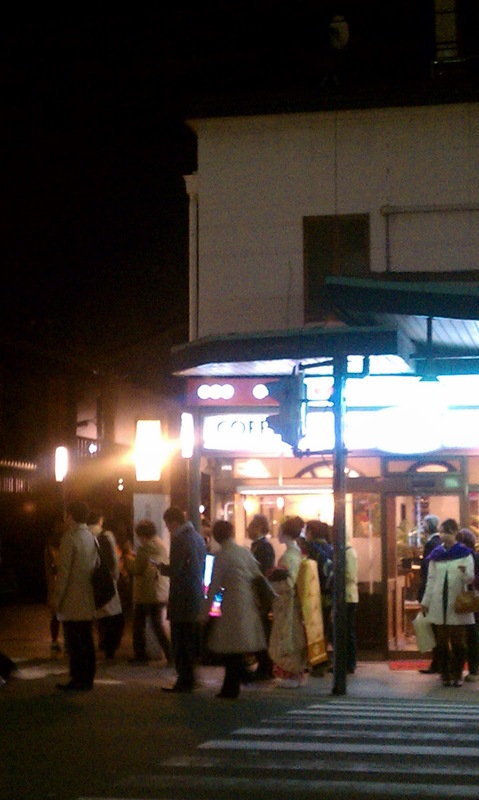 Lurking the streets of Gion at dusk (best time of day for Geisha-spotting). Camera at the ready. Being on the lookout for a Japanese woman with a startling white face, wearing a brilliant Kimono..
Gion District at dusk. No evidence of a Geisha yet. Doug didn't get it. "What's the big deal about seeing one in white face?" 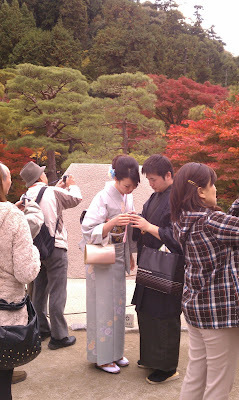 he asked, after taking pictures of women in traditional Japanese dress. I just couldn't let him think all Japanese women in kimono were Geisha. Whether or not he cared, my husband's education into all things Geisha began as we strolled the streets of Gion. I started by telling him about my immersion into the story of a beautiful, young girl beginning her apprenticeship as a Geisha in Gion and subsequently following her throughout life in the fictional "Memoirs of a Geisha" by Arthur Golden. The book depicted relentless dedication and commitment in becoming a Geisha. Although not all those in Geisha 'circles' feel it is an accurate portrayal of their lives, it opened my eyes and sparked my interest in these mysterious women. 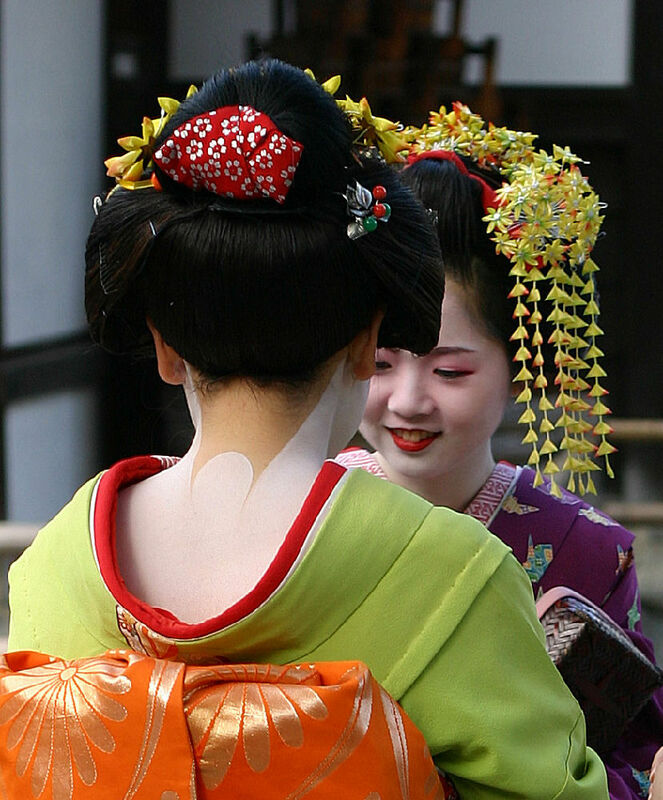 Geisha make-up is white, opaque and flawlessly applied with skin exposed at the nape of the neck. Geisha do not carry handbags or shopping bags...they have 'people' to do that sort of thing for them. Geisha hair is black and with every last hair in place. It is not cut short or styled in a messy updo. "Geisha" means "person of art" in Japanese. They are formally trained in dance and music. 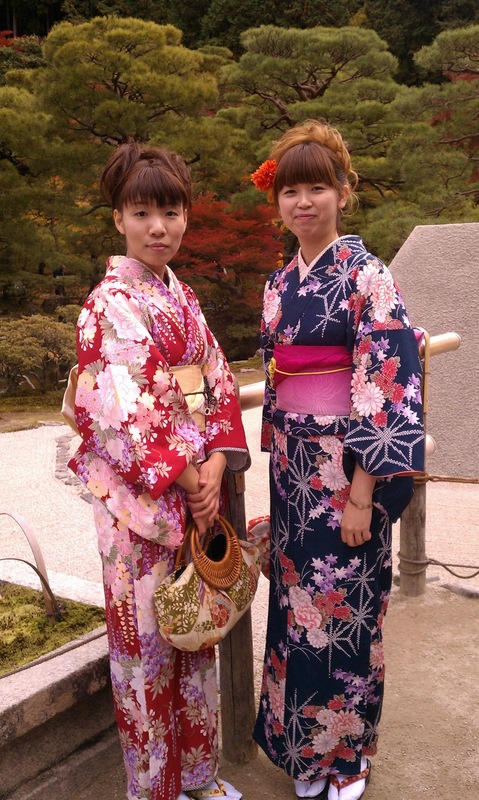 Apprentice Geisha are called "Maiko". Geisha are cultured and skilled party hostesses - not prostitutes. The current rate to hire a Geisha for a party is $200-$300 per guest for two hours of her time. The Geisha kimono reflects the Geisha's status. There are less than 1,000 practicing Geisha today. He still didn't get it. So I calmly explained...."I just want to see one OK?" Enough said. 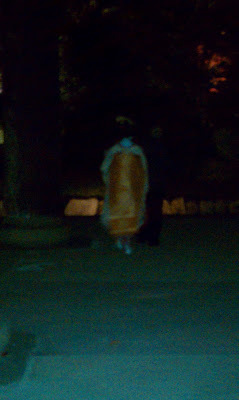 She was across the street from us, being followed by photographers and on the arm of a distinguished looking gentleman. OK, not the best shot.And then she was gone as quickly as she had appeared. 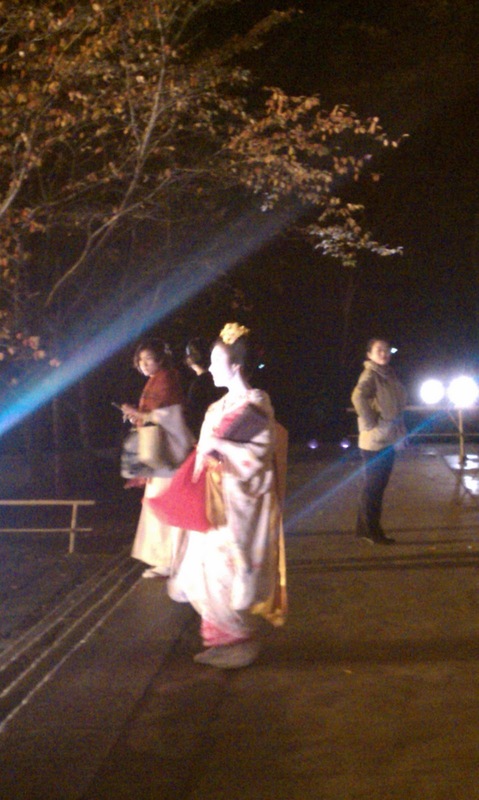 About an hour had passed without a Geisha sighting. I slacked off. My level of alertness had declined when . Doug says with urgency, "Joanie, get your camera! Get your camera!". 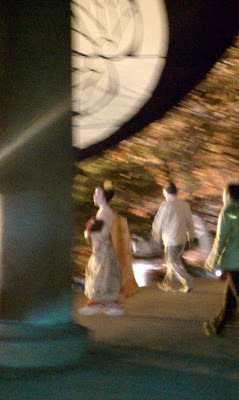 Sure enough, running with little baby steps directly towards us in her beautiful kimono and wooden flip-flops with white socks was a real-live white-faced Geisha! She disappeared into the darkness before I could get a shot of her. It was then that I realized just how fast those Geisha can move. I remained hopeful. I had to be on my toes if I were to get a picture of a Geisha. We were attending a light show that night at Chion-in Temple, and it just happened to be located very closely to Gion, maybe... just maybe... we would get another chance..
And then, in the distance, coming down a massive flight of stairs, a white-faced Geisha! No, she was not running away from me. I think she was just leaving.